The Momentum Strategy tracks the performance of three versions of the "Simple Asset Class ETF Momentum Strategy" (SACEMS), which seeks strategic diversification across asset classes via exchange-traded funds (ETF) plus a monthly tactical edge from intermediate-term momentum per the stream of research itemized in "What Works Best?". Term - monthly difference between the 10-year Constant Maturity U.S. Treasury note (T-note) yield and the 3-month Constant Maturity U.S. Treasury bill (T-bill) yield. Credit - monthly difference between the Moody's Seasoned Baa Corporate Bonds yield and the T-note yield. Equity - monthly difference between S&P 500 operating earnings yield and the T-note yield. Premium valuations are relative to historical averages. There are two versions of the Value Strategy: (1) Best Value, which picks the most undervalued premium; and, (2) Weighted, which weights all undervalued premiums according to respective degree of undervaluation. Based on the assets considered, the principal benchmark is a monthly rebalanced portfolio of 60% stocks-40% U.S. Treasury notes (60-40). "Simple Asset Class ETF Value Strategy" investigates systematic rotation to a proxy for the best-performing asset class. "SACEVS with Quarterly Allocation Updates" tests the effects on performance of quarterly rather than monthly portfolio reformation. "SACEVS with SMA Filter" examines whether applying a simple moving average (SMA) filter to SACEVS selections improves strategy performance. "SACEVS Applied to Mutual Funds" extends testing backward in time by using mutual funds rather than ETFs to capture undervalued premiums. "Add REITs to SACEVS?" [Down for update] tests the addition of a real estate risk premium, derived from the yield on equity Real Estate Investment Trusts (REIT). "Effects of Execution Delay on SACEVS" looks at effects of delaying action on changes in SACEVS portfolio weights for up to 21 trading days. "SACEVS Performance When Interest Rates Rise" examines effects of interest rates changes on the strategy. "SACEVS Performance When Stocks Rise and Fall" investigates how the strategy performs when the U.S. stock market rises and falls. "SACEVS Input Risk Premiums and EFFR" tests how the strategy might react to increases in the Federal Funds Rate. "SACEVS with Margin" and "SACEVS-SACEMS Leverage Sensitivity Tests" explore use of margin rebalanced monthly to boost SACEVS performance. "Site Changes re 'Real Earnings Yield' and 'Reversion to Value' Models" records the transition from older models to SACEVS. Some investors may want to follow one of the two strategy alternatives tracked here. Others may want to adapt them with modifications suited to their individual goals and constraints. Still others may want to apply the analysis approaches to stress other strategies. Something to keep in mind is that adding complexity to the strategy with refining variables/parameters increases the number of ways to optimize and thereby elevates potential for snooping bias. 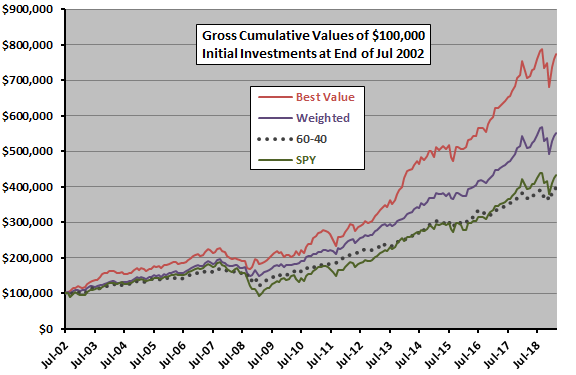 The following chart shows the gross cumulative values of $100,000 initial investments in the Best Value and Weighted portfolios since the end of July 2002 (when all ETFs considered are first available). The chart includes the 60-40 portfolio as a benchmark and buy-and-hold SPY for reference. The following table summarizes some monthly statistics for these same strategies and ETF components over the available sample period. The average monthly returns are arithmetic means. The next table summarizes annual/annualized returns for these strategies over different intervals commonly used to describe performance of funds. 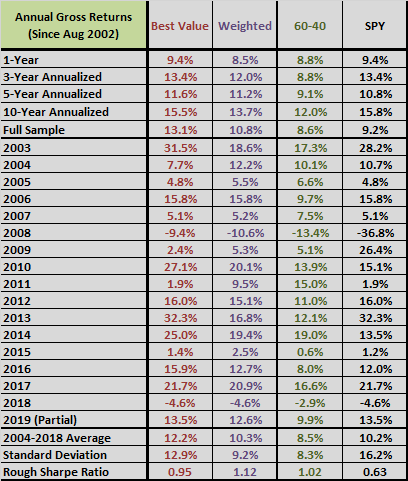 The annualized returns are compound annual growth rates. Also, the bottom row of the table presents maximum (peak-to-trough) drawdown for these strategies based on monthly measurements over the available sample period.